All-new, the 2017 Honda CR-V maintains its basic concept as a compact crossover SUV with a roomy interior. The new 2017 CR-V delivers greater interior space than its predecessor, with an especially roomy cargo area, even though its exterior dimensions have grown only slightly. Driving characteristics are just as appealing as in past generations, accompanied by enhanced refinement. Stiffening the CR-V’s platform allowed Honda to install a softer suspension, increasing the level of isolation from road turmoil. The CR-V competes with the Toyota RAV4 and other compact crossovers. Four trim levels are offered: entry-level CR-V LX, step-up CR-V EX, leather-upholstered EX-L, and top-of-the-line Touring. LX models get a carryover 2.4-liter four-cylinder engine that makes 184 horsepower and 180 pound-feet of torque. All other trim levels benefit from a turbocharged 1.5-liter four-cylinder that produces 190 horsepower and 179 pound-feet. Each CR-V has a gearless continuously variable transmission (CVT). Front-wheel drive is standard, but all versions can be ordered with all-wheel drive. When road conditions warrant, the all-wheel-drive system can distribute greater power to rear wheels for more stable handling and greater all-weather capability. Alloy 17-inch wheels are standard on LX models. EX trim level and above substitute 18-inch wheels, and the Touring gets its own wheel design. All versions except the base LX include Honda Sensing, a suite of advanced, collision-avoidance safety technology, including automatic emergency braking, adaptive cruise control, and lane-departure warning. If the CR-V starts to drift, lane-keep assist can nudge the CR-V back where it belongs. About three-fourths of CR-Vs are expected to get the safety package. A rearview camera is standard on all models. Honda Sensing also includes road departure mitigation, blind-spot monitoring, and automatic high beams. Touring trim adds rear cross-traffic alert. None of those features are available on the LX. The National Highway Traffic Safety Administration gave the CR-V five stars overall, with five-star scores for each separate crash-test. The four-star score for rollover prevention is typical for crossovers and SUVs. Top ratings also were given by the Insurance Institute for Highway Safety, which awarded the CR-V a Top Safety Pick+. Note that this award applies only to CR-Vs that include Honda Sensing safety features and LED headlights. All-wheel drive is available for all trim levels ($1,300). 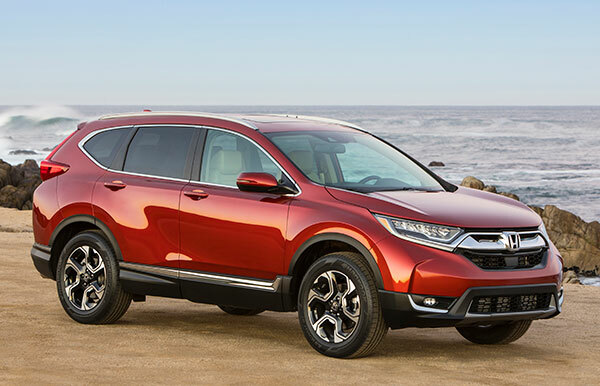 CR-V EX ($26,795) substitutes a 1.5-liter turbocharged engine, adding 18-inch wheels, heated front seats, power driver’s seat, automatic headlights, heated mirrors, pushbutton start, a 7.0-inch touchscreen, satellite radio, and moonroof. Also standard is the Honda Sensing suite of safety technology. CR-V EX-L ($29,295) includes leather-trimmed seat upholstery, a power tailgate, power passenger’s seat, driver’s seat memory, and eight-speaker audio. Navigation is optional ($1,000). Touring ($32,495) adds LED headlights, automatic wipers, a hands-free power tailgate, 330-watt audio, navigation, and side roof rails. The CR-V emits an upscale aura and it’s stylish or quirky depending on your point of view. Up front are aerodynamic LEDs, but the front bumper protrudes a bit, almost like it was added on. Upswept rear roof pillars continue a theme that debuted in the prior generation. Taillights sit high, separated by a chrome strip. Badging is oddly positioned, and the tailgate contains a curious bulge. While the CR-V’s exterior draws divergent opinions, its conventionally laid-out cabin is more widely acclaimed. For both passengers and cargo, the CR-V makes especially effective use of available space. Not only can five occupants enjoy roomy comfort, they face upgraded materials all around. The cargo area has gained nearly a foot in length, without cutting back on legroom. Back-seat leg space, in fact, has grown by 2 inches. All trim levels except the base LX include a 12-way power driver’s seat with power lumbar support. On the down side, the wide center console may cut into the driver’s leg space. The rear seat is wider than before, making space more suitable for a trio of adults. Well-organized and functional, the dashboard reaches toward luxury in top-level Touring trim. EX and Touring editions rely more on their 7.0-inch touchscreen than on traditional switches or buttons. A new screen coating is said to resist fingerprints, and a volume-control knob has been added. The navigation system is one of the easiest to use. Inputting an address is as easy as typing it in on a computer. Our navi sometimes dropped the destination when stopping and restarting the car, however, necessitating a stop to re-input. Honda aims the CR-V squarely at the core of the compact crossover market. As expected, a CR-V promises no sporty behavior. Instead, it conveys a premium feel, carefully blending composed handling skills with refined ride comfort. Newly retuned, accurate steering responds more quickly than it used to be, requiring less motion of the steering wheel to alter course. Even when rolling briskly along curvy roads, a CR-V feels securely confident. The CR-V’s suspension effectively subdues the impact of flawed pavement, yielding a soft ride without tossing passengers around on winding roads. Ride/handling balance might even top that of Mazda’s athletic CX-5. Performance is adequate with the base 2.4-liter engine. The 1.5-liter turbo is considerably stronger. Turbo acceleration and passing power are helped by torque output that peaks at a relatively low 2,000 rpm. Honda advises that a turbo CR-V can reach 60 mph about 1.5 seconds quicker than a 2.4-liter LX can, though the engine growls harshly when accelerating hard. Honda’s CVT is not our favorite transmission and it’s perhaps the weakest link in CR-V. It has an initial sluggishness when accelerating at highway speeds. Pushing harder on the throttle to compensate results in more acceleration than intended once the CVT is wound up. It’s an annoyance more than a concern, but it is an annoyance. Fuel-efficiency scores well. A front-drive LX is EPA-rated at 26/32 mpg City/Highway, or 28 mpg Combined. All-wheel drive lowers that estimate to 25/31/27 mpg. A turbo with front-wheel drive is EPA-rated at 28/34 mpg City/Highway, or 30 mpg Combined, while the all-wheel-drive version lops 1 mpg off each figure. The Honda CR-V is one of the best of the compact crossover SUVs. Every CR-V qualifies as strong in value, but the EX trim is the best bargain. Even though the base LX lacks modern engine and safety technology, it’s still nicely equipped. Mitch McCullough contributed to this report, with staff reports.